once again.....the before shots are MIA!! !.......but, to give you the background, these homeowners experienced a HORRIBLE leak in their kitchen and had to replace the floors. UGH! they felt overwhelmed and figured they may as well give the poor kitchen a facelift.... this is where i came in! kitchen cabinets were natural maple wood color, no tile backsplash, dark granite countertops, dated pendants, and no eat-in area. before, there was a built in desk area that took up way too much space. 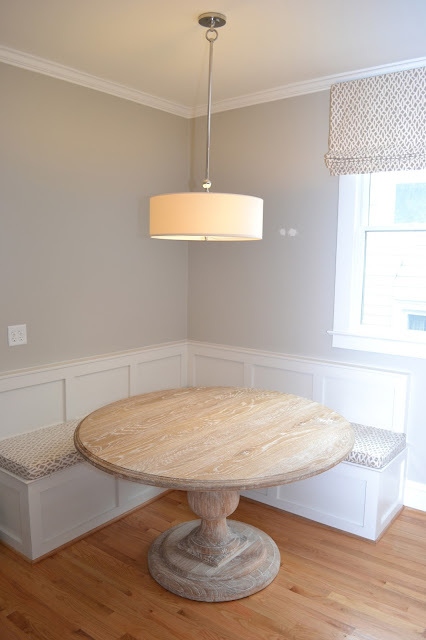 we designed this space saving built-in corner banquette to maximize the largest dining table possible. we had the bench seat fabric laminated for easy clean up! backsplash tile up to ceiling. love this effect. I love this. Could you tell me about the paint color and fabric you used? Schumacher fabric! And drawing a blank on the paint color. But we matched it to the tile color for a cohesive seem less look. That table is gorgeous! Do you know where it is from? thx liz! it a wholesaler i use out of atlanta names phillip scott. Hi Lucy! I am really interested in this table and went to the Phillips Scott website. Is this table available for purchase to the general public or do you have to have a furniture company or be a dealer to purchase? I am having trouble figuring out if it's available to be purchased by someone from the general public. Thanks! You can get one almost identical at Pottery Barn. Good to know! Thanks, Lucy -- I live in Athens, so Atlanta is not a far drive at all! Oh gosh, I love every bit of this! Wonderful table! This is fantastic! Very inspirational. I have those old maple cabinets! Wow Lucy that is a great change! I really like it. I am looking for some help with interior design in Utah. My friend says she knows someone that can I help. I just hope it turns out as nice as yours did. I am always so impressed with interior decorators! Your designs look great! Thanks so much for posting. 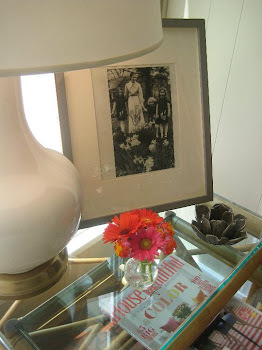 Looks great Lucy -- very impressive:) Where do you get your fabric laminated? Love the banquette area... Can I ask where the drum shade light over your table is from? THX! its from visual comfort and can be ordered thru me if you like :) ! Love the backsplash all the way to the ceiling. Great focal point. What type of and color tile did you use? thx! its a walker zanger crackled ceramic. glad you like!!! What color Walker Zanger tile is that? Latte? Just found this - I love it!!! Never thought about extending the backsplash all the way up, but it looks great. Wondering about the wall colour, do you know what it is? 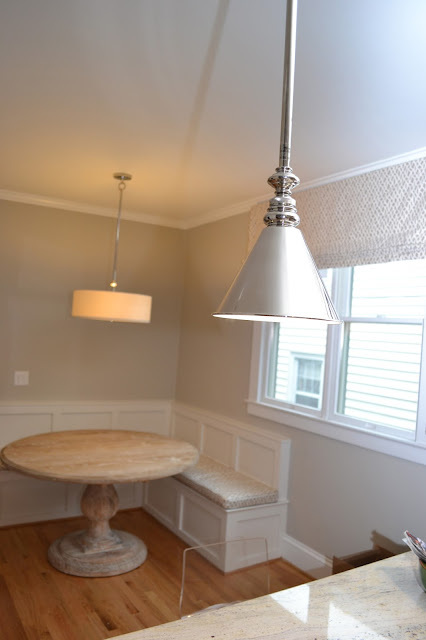 Just found this post and interested in having a banquette such as this built in my kitchen. Any details you can provide on this? Banquettes should be about 17-18" high and 18" deep with a 3" cushion on top-good luck! Do you know where the table came from? I love it! Could you give me the dimensions of the table? It's just gorgeous. thanks! You mention that you had the fabric laminated. . . can you do this to all fabrics? Did you have this done by a "professional" or is it something that I could DIY? I am so ready for a banquette in our cupola area. So needed! Yours is perfect inspiration. beautiful table and very inspiring! You are definitely an inspiration for me while I try to style my own home. Thanks for sharing. its very impressive and good looking.i also tryed to create some decorative fabric which is most essential for laminating and furnishing. This is fantastic! and Very inspirational. thanks for sharing with us. Closet Organizers can be a cheap way to improve the look of your home, in any room. I like your way of presentation,Nice and interesting post,I appreciate your work,keep uploading more, Thank you for sharing.